I preface this blog entry by saying that I am not currently employed by Wegmans (i.e., the greatest store on Earth) and I am not compensated by them in any way for this blog or anything else. Quite the contrary, I spend a lot of money at this store. Can I just tell you that I love Wegmans so much. I’ve lived in places without a Wegmans store and I don’t care to do that again. They have everything you could ever want in a grocery store. I just love going there. I would go so far as to say that sometimes I wish I were a Wegman, meaning a member of the Wegman family. I want them to adopt me. Last summer, I was very pregnant and I was parking in a special “reserved for expectant mothers” spot when I recognized Danny Wegman walking through the parking lot. It was like I saw a celebrity – like if I had seen Oprah and Gayle King hanging out and talking about their favorite books by the cart return rack. My heart rate increased and I was giddy. I took a photo of him and texted it to my husband. Now that I’m a new mom, I appreciate Wegmans even more. Every Friday night, they have a kids’ movie night in the dining area, and parents can be served a glass of wine or beer. I fully intend to partake when Punkie gets a little older. And you can take cooking classes for kids there, which makes me think that someday, when Punkie is a sullen teenager, he will be cooking dinner for his long-suffering parents. Thank you, Wegmans. Every restroom at Wegmans is fully stocked. By “every,” I mean every – both men and women. 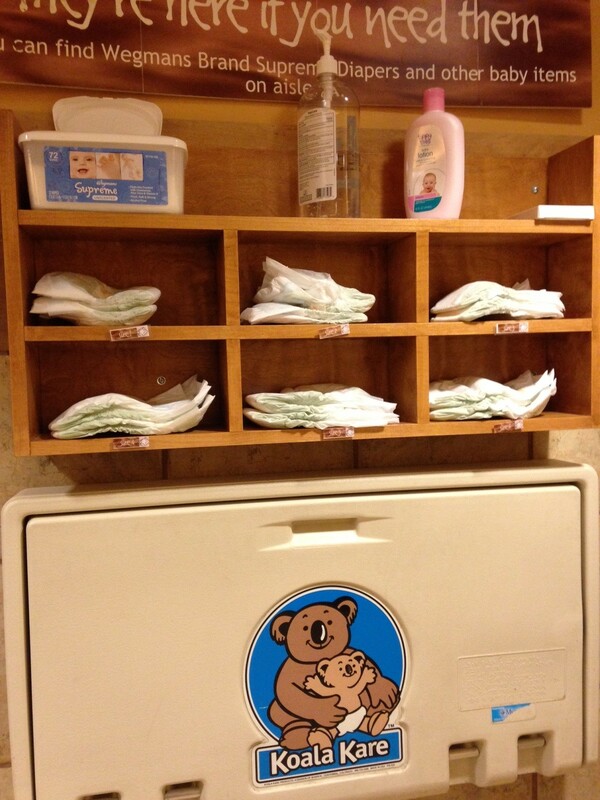 By “fully stocked,” I mean each bathroom has a big, clean changing table below a wall of free (Wegmans brand) diapers, wipes, and hand sanitizer. Yes, ladies, you can ask your husband to change the diaper because the men’s room is equally tricked out. Thank you, Wegmans. Also, I mentioned this already, but my favorite perk is that they have reserved parking spaces for expectant mothers and people with small children. These Doris Day parking spaces are so great, sometimes I regret stopping in when I don’t have Punkie with me because I have to park with everyone else. Thank you again, Wegmans. This entry was tagged mommy blog, wegmans. Bookmark the permalink.